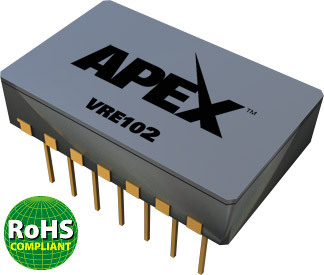 The VRE102 precision voltage reference provides ultrastable ±10V output with ±1.0mV initial accuracy and a temperature coefficient as low as 1.09 ppm/°C over the full military temperature range. This improvement in accuracy is made possible by a unique, proprietary multipoint laser compensation technique. Significant improvements have been made in other performance parameters including initial accuracy, warm-up drift, line regulation, and long-term stability, making the VRE102 the most accurate and stable 10V reference available. The VRE102 is available in two operating temperature ranges, -25°C to +85°C and -55°C to +125°C, and two performance grades. All devices are packaged in 14-pin hermetic ceramic packages for maximum long-term stability. “M” versions are screened for high reliability and quality. Superior stability, accuracy, and quality make this VRE ideal for precision applications such as A/D and D/A converters, high-accuracy test and measurement instrumentation, and transducer excitation.